Thank You, From Dr. Gale | Ross Gale is a writer and editor from the Pacific Northwest. Most of the people I know didn’t go to school for six years. Which is why I’m proud to say that I’m moving on to my sixth year of college in the fall. I once saw a movie about a guy who had been in school for seven years and he was rich and he got lots of girls and he had lots of friends and he threw lots of parties and he got lots of girls. I’m pretty sure that the girls start coming around by the sixth and seventh year. I know you might ask, Ross, are you going to school to become a doctor? And although it may appear that way on paper, with my six years of school and all, but I’m actually going to school to fulfill my dream to become a writer. The first novel I ever wrote was about a young hockey player who was recruited to play at an elite hockey school in Canada. But his performance is hampered by his anxiety on the ice. When the coach benches him he starts to wonder whether he should give up pursuing his dream. I never finished the ending, but if I could re-write it I think I would have him give up his dream of being a hockey player, have him return to his hometown where he dies in a freak washing machine accident while trying to fit his shin guards into the washer (which is a terrible idea, never do it). Its title was, Nervous on Ice. 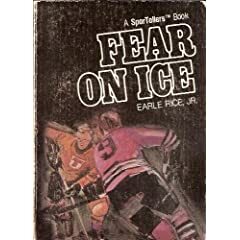 Not to be confused with Fear On Ice, which was a short young adult novella about a minor league hockey player who seriously injures another hockey player in a fight and then is afraid he might hurt other players as well. Fighting in hockey wasn’t my cup of iced chai tea with a dab of cream. As the girls in my sixth and/or seventh year of school will say, I’m a lover not a fighter. But there were times in my long and respective hockey career where I was called upon to fight and/or seriously injure an opponent. The first time I seriously injured an opponent I wasn’t actually asked to hurt him. I accidentally caught the other team’s best player in the baby makers during the face-off. He didn’t finish the game. Our following game I was heckled by his teammates from the stands. I was actually oblivious to this all, even the accidental sticking. The second time I hurt someone was in an actual fight. He was from Alaska which meant he lived in an igloo and he was crazy like a wolf. To give an example of his craziness, towards the end of the year when we were trying to make the playoffs, this crazy Alaskan tackled one of my teammates and tried to poke his eyes out. Our fight was violent and gruesome so I’ll save us all the details. My opponent did wear aviator sunglasses to the rink the next day, if you catch my big winking hint that’s quietly telling you he had two large, purple-black eyes. I’m getting bored telling old war stories that I need to save up to tell the kids that I’m going to have with the girl that I’ll meet in my sixth and/or seventh year of college. So I’ll stop. But I do want to tell you that I’m going to be helping out at this summer camp for three weeks and that my blogging will continue somewhat. But if it’s not as much as normal then still come back and look at everything you’ve read already read because my self-esteem and self-worth are dependent upon my readers everywhere. But I do want to thank those who take the time to brows and skim and watch and sometimes, if the first line is engaging enough, read my blog. I don’t know all of you who stop by, but if you’re not a stalker and you’re ever in Portland drop me a line and I’ll invite you over to one of the college parties I’ll be throwing because I’ll be so popular. I’ll introduce you to all of the girls that I’m going to meet. To curb your already growing enthusiasm to leave a comment so I can subsequently make fun of you, I’ll send you to J.K.Rowling’s commencement address at Harvard. Remember, some Harvard uppity’s were insulted by having a children’s book author speak at their commencement. She was good. very interesting post. you got a couple chuckles out of me. no i’m not a stalker, and not really up for college parties as explaining i’ll now be a single mom of 3 (sorry about the TMI) doesn’t really help the conversational flow all that well. so go ahead… bring on the making fun of. Did you know I invented the phrase TMI? Nobody believes me, but I remember thinking that “too much information” could be shortened to a quick, catchy three letters. sure you did… just like i can catch like ichiro.